These resinoid wheels are for use with hand grinding machines with a peripheral speed of up to 80 m/s, and suit the grinding of a broad range of materials. They are reinforced with fibreglass and can be supplied with straight or depressed centres. 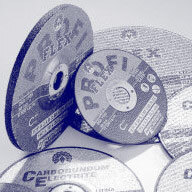 Select a wheel thickness in the range of 2-3.2 mm for cutting, and ensure that they are not used for grinding. In grinding applications, used depressed centre wheels with a thickness between 4-10 mm. The touch angle between wheel and material should be 30 degrees. For further enhanced performance we can supply profi-ling life resinoid wheels made to order. Please contact us for more information about price and availability.